Hello lovelies! It's now right before Halloween when plenty of you are probably knee-deep into preparing your costumes for the parties going on this weekend. Since a lot of costumes don't require a specific look, I thought I would do a more generic smoky eye look to compliment any costume. If you want to have striking, smoky charcoal eyes this year then watch the video below! You can see how the black wraps around the charcoal color here. You say gun? I say makeup brush. I hope you guys had fun watching and fingers crossed, it will come in handy for some of you as well. If you happen to do any of my tutorials, please post a pic of your final look to my Facebook page gallery! For my past Halloween blog posts click here. So cool! Great lipstick too! Hi Jen, I loved this look! I have quick question: for the false lashes, did you use the glue included in the lashes, or did you use a different one like DUO? If you used the one from the lashes, how long did they last on you? Thanks! The smokey eye looks so good on you! I love how you paired it with the bright red lips too. Incredible look! Love the lipstick! Great tutorials! Your hair looks amazing! Lol! Love how you even got garters that go with your costume hahaha. 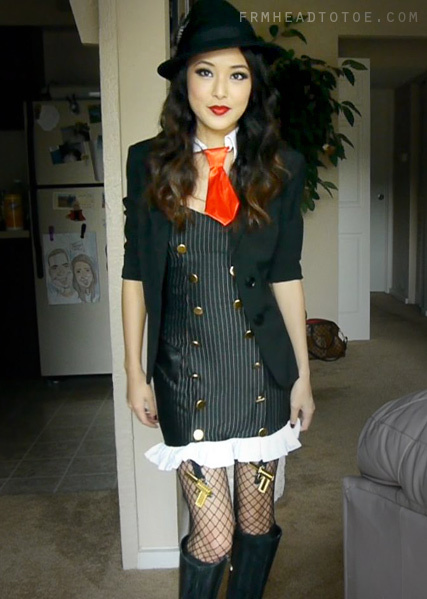 I love your off beat and creative halloween ideas! Have you seen this video yet?? You should totally do a look from this mv! this is such a great look! you make it look so easy to do. very inspiring! I always enjoy watching your tutorial!!! especially eye makeup part!!! you always do the magic makeup turn out so so so beautiful^^ love it!!! I love seeing girls pull off red hot lipstick! go you! Absolutely gorgeous, love the makeup. Just wanted to let you know that I used your makeup tutorial for my Halloween outfit and I LOVED it! THANK YOU! Do you know the voltage of the bed head Deep waver ? Would like to purchase but no idea if it's suitable for the plugs in my country.. Pls drop me a reply! Thank u. Thanks for the lipstick test, it is fun but useful.